Following on from last year's welcome Blu-ray release of Walter Hill's excellent survival thriller Southern Comfort, Second Sight have announced a June release for its immediate predecessor and stylistic blood brother, the 1980 western, The Long Riders. The film follows the exploits of the infamous Jesse James/Cole Younger gang, made all the more authentic by Hill’s casting of real life brothers David, Keith and Robert Carradine, James and Stacy Keach, Dennis and Randy Quaid, and Christopher and Nicholas Guest as the real-life outlaw brothers from history. In post-Civil War America the legendary band of outlaws blaze a trail across the west, culminating in the infamous Northfield, Minnesota bank raid and one the most explosive climaxes in the history of the western. With stunning cinematography, and an evocative Ry Cooder soundtrack and inspiration drawn from John Ford to Sam Peckinpah, Walter Hill's The Long Riders is an elegiac portrait of a bygone era and one of the last great Westerns of the 20th Century. 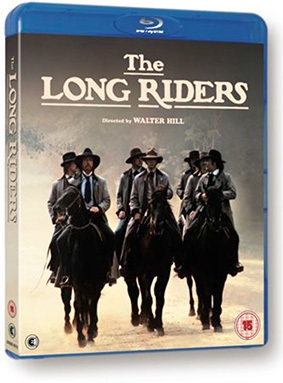 The Long Riders will make its UK Blu-ray debut on 3rd June 2013 from Second Sight at the RRP of £17.99.